My16 (manuf Dec 15) Deliv end Feb 16. 250d diesel with Ad Blu. My17 (manuf ….. ) Deliv …..
Last edited by Teckno; 08-09-2016 at 10:17 PM. Reason: Oops, internet slow, post was duplicated ! Melbourne Herald Sun, Carsguide , Fri 19 Aug.
"This is arguably one of the best all- rounders, with tantalising combinations of style and safety, function and performance, practicality and luxury. No wonder there's a waiting list." After just over 5 months and lots of research, I bit the bullet and had my GLC treated with external paint protection, wheel and tyre protection and interior treatment, both trim, floor and leather seats; also external glass treatment. Car was left with specialist for 4 days to allow clean, paint correction, treatment and seal. Involved heating or baking under UV lamps I think. The result is amazing, I am soooo happy with the professionalism, quality of work. GLC looks better than when delivered, even after 13k . I do try and look after our cars, but this was better than expected. Not sure how to post photos here, drop box ? Price so much better than dealership, but it was not really about price, it was about knowing who was doing the work, how it was done and after sales service, advice and product sale of any supplemental product. It also meant that I could re visit for advice and any fix. Treated with Concours Nova EVO and Si. Here is the link to my new paint treatment. Very happy with workmanship and overall service, top marks to David at "Auto Alchemy" at Airport West. Well Auto Alchemy has got that "shining like a diamond in a goat's a$$" as our friends in the Land of the Free would say. I don't know that particular paint protection combo but would assume it is one of the silica oxide based ones as it needed curing with heat lamps. Gtechniq Crystal Serum + EXO a.k.a. CS Black is probably the most well known equivalent here in the UK. It guarantees protection for 7 years. I guess UV protection is also a big concern Downunder. I went old school D.I.Y. with mine - 12 hours of machine polishing to knock back some of the orange peel that now comes free with every new car followed by two coats of Blackfire Wet Diamond Paint Sealant topped off with six, yes SIX, coats of Blackfire Midnight Sun ivory carnauba wax. Red paint just loves carnauba. The flake pop and depth is just immense! You need to upload your pictures to a photo hosting site then add the link to your message here. I use Photo Bucket which is one of the more popular sites. It will provide you with the "IMG" address. Just left-click on it and it will automatically copy it to your clipboard then right-click in the body of your message and Paste the link. Your picture will then appear in your post just like the picture below. Your car looks brilliant, the red really pops . I take my hat off to you for doing it all yourself, it certainly must give you a great sense of achievement. Happy motoring and again, big tick what you have achieved. This is what I had done, to my GLC, mainly Nova EVO And Si, plus wheels, glass, leather and trim, carpet. Here is the new range. mainly Nova and Si, with glass, wheel, carpet and leather treatment too. David is the technician I used, they have other recommended or accredited technicians in most of the other States in Oz. they maybe looking at opportunities in USA. Car just had its first wash with foam and pat dry and air dry using mini vac blower, very impressed, I'm off to buy a mini blower , like Rok or Makita, electric, not battery at this stage. They have a soft rubber nozzle, so limited chance of duco scratch if you get too close !!! Still happy with my decision, several friends are now having their cars treated by David, incl a new Jag and our daughters Mazda. Will get the BMW 330ci done after that too. To other GLC diesel owners. Have any of you suffered engine light on dash and car stalling, or shuddering when trying to start ? Road side Assist diagnosed as code P0087 – fuel rail / pressure system too low ? 2nd time in 10 days. First was reset, now it's on a flat bed back to dealer to undergo diagnostic and hopefully a fix. Just wondered if this might be a one off, or others in the GLC family suffering similar issue. Hi Techno, What fuel have you been using? As you are probably aware there are currently different diesel blends available in Victoria. Winter fuel is more commonly sold in regional areas especially approaching the snowfields where alpine temperatures can cause summer fuel to solidify and leave you stranded. This is our third diesel, never happened before. Have not been to the snow this year and Melb temps in Aug have been mild. Aware of additive, but not needed yet. Hopefully it's only a sensor or a fuel filter. I tend to buy fuel from local Caltex, Vortex, but also use BP and Shell, all high volume sellers. So really hoping its not dirty fuel ! As I use fuel cards, I can back track when and where. Hi Guys. My first post on this forum. 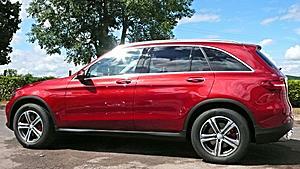 I currently own an A250 Sport but have ordered a GLC 250d which will be delivered by November. I ordered virtually everything except tv. Arctic White (deleted running boards), vision, command, AMG, night pack, seat comfort, air body control, air fragrance. Will also add tint to front/side windows, and get clear film for rear windows and interior of sunroofs (film will help with UV protection as well as strengthen glass in case of smash/grab). I'm most looking forward to the air body control, and intelligent lights. Techno, how do they compare to bi-xenon? My A250 has bi-xenon and they are ok, but lack depth (even my ex work Camry headlights penetrated down the road further). The BMW 320 before the A250 had probably better lights, as did the VW GTI before that. I'm not saying that the A250 has poor lights, but they're not fantastic. Re HUD, I've seen comments about the positioning of the display, but it's my understanding that this can be varied to suit. Re polarised sunnies, on test drives I could still see the display, albeit less brightly than without glasses. I think the 'workaround' here might be to put the HUD higher on the screen and look over the top of the glasses. Time will tell. I'd love to know why MB doesn't paint the brake calipers red with the 'AMG'ised' models as they did in my A250. The GLC has large 4 piston units and would look great through the AMG wheels if painted. I'm thinking of getting mine done with the 'Mercedes Benz' decals and clear gloss over the top. Great decision getting a GLC. Congratulations. Great options, I regret not getting air body control. With tinting good choice, however warning re installing to glass roof and sun roof, did some research and not recommended. There is a real issue of glass possibly exploding due to lack of expansion , other brands have had issues when tinted roof and sunroof. We have had our 250d in summer and I do not slow fry my balding head ! MB system works great and factory glass tint excellent , screen also very good at insulation. New generation LED smart headlight 'to die for', brilliant in all aspects. Penetration good, side cover, ESP left side fantastic, even tracks road signs and holds light on them till last safe moment, so you have plenty of time to read. Lights go around car in front to illuminate sides and distance !! HUD is a 'keeper'. Have not tried polarising glasses yet, I have trNsition lens, works with them. HUD CAN BE ADJUSTED TO SUIT DRIVER, NO ONE ELSE CAN SEE IT. I THINK IT IS LINKED TO SEAT POSITION SO WILL ADJUST, OOPS CAPS LOCK, if you save your seat position then HUD wil, be saved too. Agree with you re brake coatings and missed opportunity to 'bling it up a bit'. Whirlpool in Oz also has a good Mercedes GLC specific forum, not as good in layout as this site where you can search by sub topics, have to keep reading whole of Ozzy post as it jumps around a bit ! Happy driving and consider paint treatment after you have purchased from a specialist paint technician. The LED intelligent headlights are considerably better than the bi-xenon's on our W204 C class. Suggest you get your smart phone and check the barcode in your fuel filler cap, the QR sticker. This is used by Emergency Services to work out how to cut you out of your car in the unfortunate case of an accident. Mine links me to left hand drive diagram. Air bag wrong side, battery on wrong side...... Not happy, dangerous for those in cabin, dangerous for SES Workers using power tools. Dealer said this was news to them ! Wait and see how long to change the internet link, my guess is all GLC in Oz will need new QR stickers fitted (2 per car). Let us know if your car is ok or wrong configuration. Last week I reported GLC 250d stopped for the second time. Dealer was excellent, kept the car for a week whilst I used their loan unit. Diagnosed as Fuel distribution rail faulty. Car has travelled 14k. So really no wiser, assume some sensor in fuel rail ? But car runs just like new again. One interesting aspect, checked my docket and my warranty had been reduced by the MB system by 2 ½ months, including changing delivery date..... Strange, Dealer could not explain as fields locked. Advised last night MB have now corrected data error – pays to check documents. Thanks Techkno. I wasn't aware of issues with sunroofs popping when tinted. I'll do some research. My A250 and the BMW 320 both had the roof's tinted with no issues, but then the GLC has larger surface area so maybe that's an issue. I do know that I could definitely feel the difference with both vehicles being tinted. I'll look into paint sealer but have always loved maintaining the paint myself with mechanical polishing (Menzerma) using different grades down to 4000, and good quality wax (Dodo Supernatural or Hybrid Supernatural), finished with Dodo Red Mist. Yes I used to wash my cars very carefully and buy lots of different product over the years, to the point of having 3 shelves in my garage of care product..... Tragic I know. I bit the built with Auto Alchemy, as I wanted to talk with the person doing the work, was not happy with "we come to you" operators, or others that you drop off the car in the morning and collect in the afternoon. With David at AA, he inspected the car, took time to help me understand options and gave me options with him. I am fastidious , but not confident to do what you do, esp with clear coat and me damaging it. I washed my car with a foam lance, washed it down and used a mini hand blower to dry it off. Still took some time, arms not as sore, great finish. Cqfinest, or retailer at Wax It is where I get supplies if David has none. If your not from Melb, I think David could recommend a technician he trusts. Happy motoring, the GLC is brilliant. Is anyone negotiating, or have paid a deposit for a GLC Coupe ? 250d. We have ordered another GLC, but are looking to cancel order and buy Coupe instead. Interested to get an idea of pricing and build month ? Just reviewed a video on new GLC Coupe, not too bad. Ventus SV1, SUV. Not sure if they are run flat MOE. Be interesting to see if they make it to Oz. 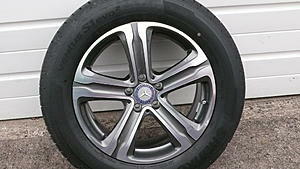 I recently purchased a replacement 20" Pirelli Scorpion MOE, in Melb for around $510. Re carpet mats in GLC. Noticed Oz AMG mats different to USA and Europe. The Oz driver side only has a "flap" that extends between left foot rest and right side accelerator pedal. In USA, even though they are left hand drive they have two "flaps", one on the left foot rest. In Oz, this means no protection to stain and wear and tear to base carpet as no mat protection. I think there is a UK Seller on EBay that sells modified mats for right hand drives. Pity MB designers save cost, or did not think it important and altered design for our market. 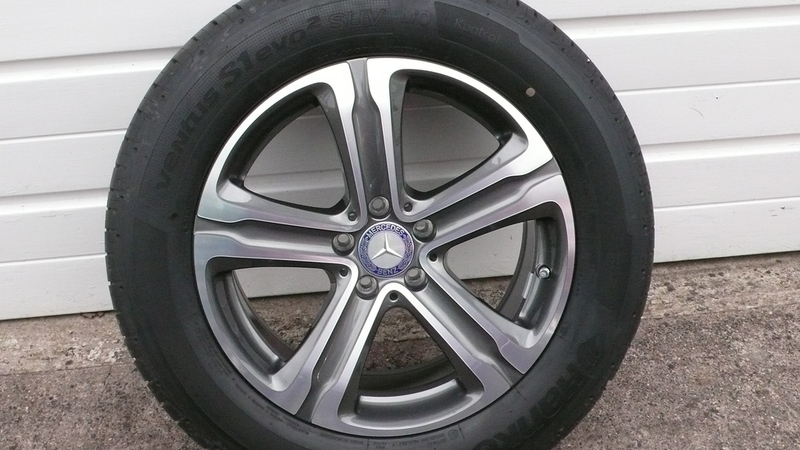 I have the Hankook Ventus S1 evo2 SUV tyres and they are definitely not run-flats. These Hungarian 235/60R18 tyres are fitted to my 2016 220d optioned with air suspension and off-road package. Mine was supplied with the air compressor and can of jollop to deal with a puncture. Just a note for those with the command system, If you hold down the Voice activation button for a few seconds more than you would usually, you get Siri voice commands instead of the factory voice commands. Tried this today with my Dec 15 built GLC. WORKED with Siri, told me the street I was in. Later tried again and had my unread SMS read out to me with option to respond. Have not yet got it to make a call for me, but all promising to date. Our GLC 250d was manuf in Dec15, took delivery end Feb16, travelled 16k. Only issues to date, loss of audio, stoped turned off, restarted, all good again. Needed wheel alig around 5-7k as front left was " feathering" with extra edge wear and slight pulling to left. $240 was a bit steep for a wheel align when tyre shops charge $80, had to ask for print out, worth it, I now have factory data with upper and lower limits for all 4 wheel settings. Final issue to date, and most serious, was low fuel pressure that caused car to stall, then limp home. Flat top towed to Dealer and a week later car returned with new fuel rail...... did not make sense, but it worked. 20 days later car stopped, same issue. Towed in , 5 days off road, replaced fuel quantity control valve and fuel pump. Issue seemed to trigger when remaining driving range was 170 – 200km, so pump seemed to malfunction when fuel level dropped. Dealer also noticed error codes for pre safe warnings, they replaced and recalibrated the camera. Am I concerned, not really. Issue seems minor, real test was Dealership, they were fantastic, kept me informed, were apologetic and provided a loan car. By the way I was looked after I am confident the GLC will be ok.
We were to buy a second one for " she who must be obeyed" ! However the wait list kept getting longer so we bit the bullit and have order a GLC Coupe, that way deliver quicker and not the same body shape in driveway, at least from side or rear. Very excited for delivery, ETA around end Jan17 at this stage. GLC spec sheet, as at 19 Aug 16 for Aust. New links for the GLC Coupe. Last edited by Teckno; 10-20-2016 at 05:12 AM. Reason: Add Coupe.